This article describes how to extend an existing Spring Boot application with a search functionality using Elasticsearch. In the example, one local node is operated and an installation of Elasticsearch is not necessary. If a Spring Boot application should be equipped with a powerful search functionality, then this variant is one way to achieve that. For example, a fuzzy search is possible and the use of the query DSL makes it easy to implement complex search queries. Here is an example of an existing Spring Boot application that manages objects of type Item. An item has an id, a description and a place where it is located. It shows how an item can be found with a part of the description and the storage location. In general, the extension described here works in such a way that the search arrives at the Spring Boot application via the REST controller. Afterwards, a search is executed using the SearchQueryBuilder and the items are exported from the Elasticsearch node and returned to the caller. At the start of the application the migrator (ItemMigration) exports all items from the relational database and stores them in the Elasticsearch node. First, create a configuration that defines the repositories (EnableElasticsearchRepositories, EnableJpaRepositories). In addition, the local Elasticsearch node is configured. The domain class used for the relational database, in line 14 can you can add the annotation @Document so that Elasticsearch can handle items. Also the index name Item and type is set there. * Created by hameister on 24.12.16. The controller defines the new REST endpoint, which can be reached at /item/elastic. In addition, the incoming request is forwarded to the SearchQueryBuilder, which performs the search in the Elasticsearch node. * Created by hameister on 26.05.18. In the class SearchQueryBuilder the search for the items is defined. The example uses only the description and location for the search. It is also possible to use the entire query DSL to expand the search. 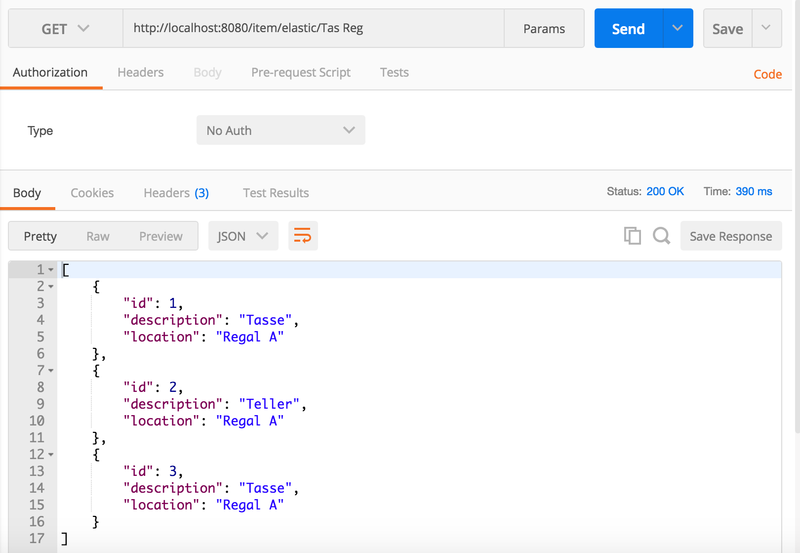 Query in Json format. Only description ans location are used for the search. This SEARCHTEXT will find all Tassen in Regals. Finally, the class ItemMigrator is used to export the complete data from the relational database when the application is started and stores it in the Elasticsearch node. Notes: In a productively used application not only a local node should be used, but at least one Elasticsearch instance. Besides, the data should not have to be exported completely from the relations database every time. It should be noted that with Spring Boot 1.5 the two repositories can not be in the same package, otherwise the component scan will not work. This issue should be resolved with Spring Boot 2.0. The complete source code can be found in the Github repository at the following url https://github.com/hameister/ItemStore. The extensions are in the branch elastic. The following screenshot shows how to call the REST endpoint with Postman, for example, to search for cups Tas for Tasse on shelves Reg for Regal.